That’s right! It’s time to bring back the trusty holiday gift guides. I’ve got some great ideas lined up for ya’ll this year for your besties, boy-toys, your mom, your kids and last but not least, stocking stuffers under $100. Each week I’ll be featuring a different guide, so stay tuned for a new category next week! This week I’m focusing on some go-to gifts for your girlfriends. A gift I plan on giving this year is this adorably cheeky Christmas pillow – the embroidered message says it all and it’s only $38. Win, win! great gift guide love the earbuds. I can’t believe its holiday season already! I love the jeweled earrings. That’s a great a gift choice! These gifts inspirations are amazing ! I love the initial earrings for a friend of mine, gotta buy them ! Loving these Mr and Mrs glasses, might have to gift them to myself! Loving this gift guide! I’m obsessed with those Furbish Studio glasses. And those wine carriers are a fantastic hostess gift! I can’t wrap my brain around the fat that we are talking about Christmas gifts. I love those cute Mr and Mrs glasses. That scarf is gorgeous too! Great picks! i’m loving the linen wine carriers. such a creative idea for christmas or for bridesmaid gifts! Good idea! I need to start planning, because I always fall behind. My girls would love the bottle of wine, and those earbuds are amazing. 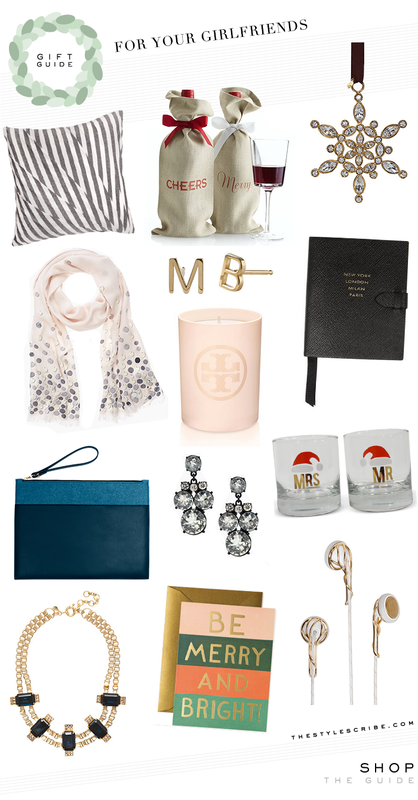 Great picks…especially the jewels, pillow and Tory Burch candle. I love the Tory Burch candle- it smells amazing. I love your gift guides- looking forward to them this season.